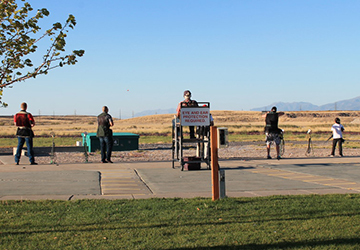 Join us at the Great Salt Lake Gun Club on October 1, 2015 at 4:00PM. Trap Shoot Registration Now Open. Utah Mechanical Contractors Association Trap Shoot Registration Now Open. Registration is now open for the UMCA 2015 Annual Trap Shoot! Join us at the Great Salt Lake Gun Club on October 1, 2015 at 4:00PM. Registration costs $55 per person and will include two rounds of 25 targets from the 16 yard, a BBQ dinner, entrance into a prize drawing, and an event t-shirt. Each shooter is responsible for their own gun and shells. Sponsorship opportunities are available as either a $250 silver sponsor or $500 gold sponsor. Sponsor logos will appear on the back of the official trap shoot t-shirt. The deadline to register to become a sponsor is Friday, September 11, 2015 and the deadline to register to participate in the event is Monday, September 21, 2015. To register online, click here or download the pdf registration form here. We look forward to seeing you there!